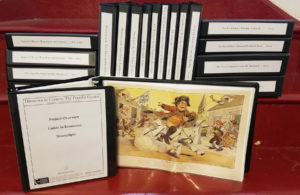 The Dane G. Hansen Foundation funds assisted in a project to research and archive historic sources around the work of S.P. Dinsmoor and the Garden of Eden folk art sit e. Eighteen 18 volumes of resource material are now available to visitors and scholars. The research has changed some of the tour and historic information shared at the Garden of Eden, limiting the information to that which can be proven or backed up with specific, site-able facts. Perhaps most importantly, the research cleared up some mysteries as to the motivations of S.P. Dinsmoor in the making of the Garden of Eden, and the visual clues that inform the sculptures themselves. A new brochure will be developed for tourists.